30 A peak) without a heat sink. It ships with the power capacitor and connectors installed as shown. 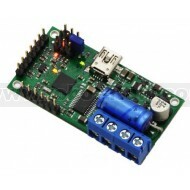 Note:For 24 V applications, we recommend the 24v12 or 24v23 versions. 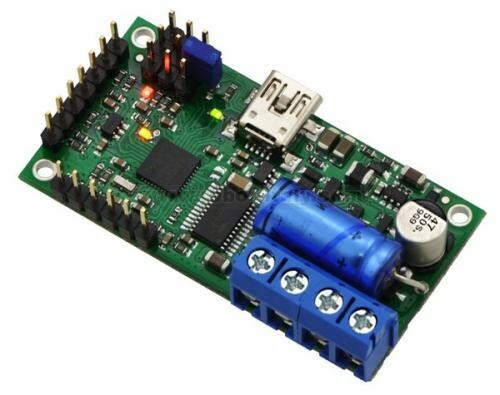 We strongly recommend against using the 18v7, 18v15, or 18v25 with 24 V batteries, which can significantly exceed 24 V when fully charged and are dangerously close to the maximum voltage limits of these lower-voltage controllers. Optional command timeout (shut off motors if communication ceases). Supports automatic baud rate detection from 1200 bps to 500 kbps, or can be configured to run at a fixed baud rate. Warning: The included terminal blocks are only rated for 16 A, so we recommend soldering thick wires directly to the connector-free version of the board and using higher-current connectors for applications that will exceed the terminal blocks’ ratings. Take proper safety precautions when using high-power electronics. Make sure you know what you are doing when using high voltages or currents! During normal operation, this product can get hot enough to burn you. Take care when handling this product or other components connected to it.